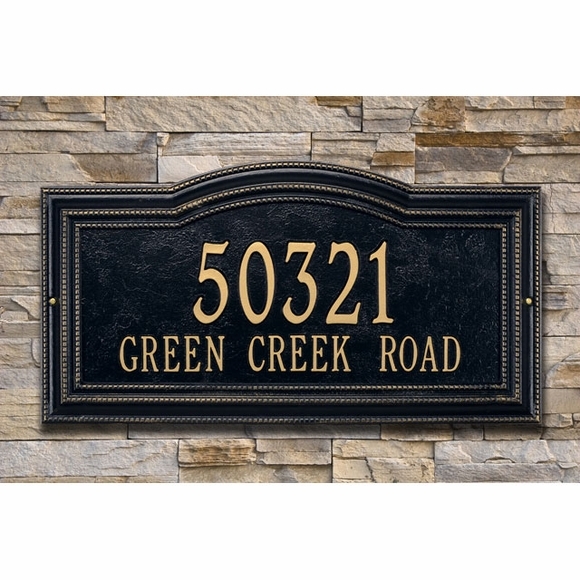 Personalized Beaded Border Arch Address Plaque - - upscale and unusually wide address sign comes in a grand 24.5" x 12.875" estate size as well as a more standard 18" x 10.25 size. Available for wall mount or lawn placement. Made in the USA. The triple border of beading and relief of the frame create an impressive three-dimensional appearance. The standard sign holds five 4" numbers. The estate sign holds five 5.5" numbers. The standard sign holds five 3" numbers on line 1 and up to seventeen 1.25" characters on line 2 (including spaces). The estate sign holds five 5.5" numbers on line 1 and up to seventeen 1.75" characters on line 2 (including spaces). Dimensions: 18"W x 10.25"H x 1.25"D and 24.5"W x 12.875"H x 1.25D". Love the look - nice and big and fills in the space needed. Good quality.